Simplest case -- assumes source and dest have same interval. Simplest case -- do all components. Simplest case -- do all components. Accepts a pre-built copier. Accepts an arbitrary component range. asynchronous exchange start. load and fire off messages. These functions will invoke error messages when invoked. C++ will ensure that constructors are not called for the base class by a user, but a 'define' function has no such protection, hence the need to prevent such usage. A runtime error is not a perfect solution...(strong construction gets around this *sigh*). classes that derive from LevelData will have to turn its valid defines into runtime errors also and make its own defines. Thus taking over the job of the compiler. Data over a disjoint union of rectangles. References BoxLayoutData< T >::allocateGhostVector(), Copier::define(), MayDay::Error(), BoxLayoutData< T >::interval(), BoxLayout::isClosed(), LayoutData< T >::m_boxLayout, BoxLayoutData< T >::m_comps, LevelData< T >::m_disjointBoxLayout, LevelData< T >::m_exchangeCopier, LevelData< T >::m_ghost, BoxLayoutData< T >::m_isdefined, BoxLayoutData< T >::m_threadSafe, BoxLayoutData< T >::setVector(), DataFactory< T >::threadSafe(), and IntVect::Zero. References BoxLayoutData< T >::allocateGhostVector(), CH_TIME, Copier::clear(), Copier::define(), MayDay::Error(), BoxLayout::isClosed(), ProblemDomain::isPeriodic(), LayoutData< T >::m_boxLayout, BoxLayoutData< T >::m_comps, LevelData< T >::m_disjointBoxLayout, LevelData< T >::m_exchangeCopier, LevelData< T >::m_ghost, BoxLayoutData< T >::m_isdefined, BoxLayoutData< T >::m_threadSafe, DisjointBoxLayout::physDomain(), DataFactory< T >::threadSafe(), and IntVect::Zero. Referenced by aliasLevelData(), blockRead(), PetscSolver< T >::computeResidual(), LevelDataOps< T >::create(), PetscSolver< T >::create_mat_vec(), LevelData< T >::degenerate(), LevelData< T >::degenerateLocalOnly(), BaseLevelHeatSolver< LevelData< FArrayBox >, FluxBox, LevelFluxRegister >::incrementFlux(), and read(). References BoxLayoutData< T >::allocateGhostVector(), CH_TIME, Copier::clear(), LevelData< T >::copyTo(), Copier::define(), LayoutData< T >::m_boxLayout, BoxLayoutData< T >::m_comps, LevelData< T >::m_disjointBoxLayout, LevelData< T >::m_exchangeCopier, LevelData< T >::m_ghost, BoxLayoutData< T >::m_isdefined, BoxLayoutData< T >::m_threadSafe, DataFactory< T >::threadSafe(), and IntVect::Zero. References BoxLayoutData< T >::allocateGhostVector(), Interval::begin(), CH_assert, CH_TIME, Copier::clear(), Copier::define(), MayDay::Error(), LayoutData< T >::m_boxLayout, BoxLayoutData< T >::m_comps, LevelData< T >::m_disjointBoxLayout, LevelData< T >::m_exchangeCopier, LevelData< T >::m_ghost, BoxLayoutData< T >::m_isdefined, BoxLayoutData< T >::m_threadSafe, BoxLayoutData< T >::setVector(), Interval::size(), DataFactory< T >::threadSafe(), and IntVect::Zero. References LayoutData< T >::box(), LayoutData< T >::boxLayout(), CH_TIME, LayoutData< T >::dataIterator(), LevelData< T >::m_disjointBoxLayout, and DataIterator::size(). Referenced by LevelDataOps< T >::assign(), LevelData< T >::copyTo(), BlockBaseRegister< T >::copyToSrcRegister(), LevelData< T >::define(), LevelData< T >::degenerate(), and MergeSolver< T >::solve(). References LayoutData< T >::box(), CH_TIME, LayoutData< T >::dataIterator(), LevelData< T >::disjointBoxLayout(), MayDay::Error(), LevelData< T >::ghostVect(), Box::grow(), minBox(), and DataIterator::size(). Referenced by LevelData< T >::localCopyTo(). References CH_assert, BoxLayoutData< T >::interval(), LevelData< T >::localCopyTo(), and BoxLayoutData< T >::nComp(). References CH_assert, LevelData< T >::copyTo(), BoxLayoutData< T >::interval(), and BoxLayoutData< T >::nComp(). FM MOD. END //////////////////////////// same as copyTo that takes a BoxLayoutData, except that it fills the ghost cells of 'dest' with data from 'this' also. References LayoutData< T >::box(), LayoutData< T >::boxLayout(), LevelData< T >::copyTo(), LayoutData< T >::dataIterator(), MayDay::Error(), LevelData< T >::getBoxes(), LevelData< T >::ghostVect(), LevelData< T >::m_disjointBoxLayout, LevelData< T >::m_ghost, DataIterator::size(), and IntVect::Zero. Referenced by PetscSolver< T >::computeResidual(), BlockBaseRegister< T >::copyToSrcRegister(), PetscSolver< T >::create_mat_vec(), and LevelData< T >::exchange(). References LevelData< T >::exchange(), and BoxLayoutData< T >::interval(). References CH_TIME, Copier::define(), LevelData< T >::exchange(), Copier::isDefined(), LevelData< T >::m_disjointBoxLayout, LevelData< T >::m_exchangeCopier, LevelData< T >::m_ghost, and IntVect::Zero. The most general case -- can accept an arbitrary component range, a pre-built Copier object, and an arbitrary accumulation operator. References CH_TIME, BoxLayoutData< T >::interval(), BoxLayoutData< T >::makeItSoBegin(), and BoxLayoutData< T >::makeItSoLocalCopy(). References CH_TIME, BoxLayoutData< T >::interval(), and BoxLayoutData< T >::makeItSoEnd(). References CH_TIME, BoxLayoutData< T >::interval(), BoxLayoutData< T >::makeItSoBegin(), BoxLayoutData< T >::makeItSoEnd(), and BoxLayoutData< T >::makeItSoLocalCopy(). Referenced by aliasLevelData(), blockWrite(), PetscSolver< T >::computeResidual(), LevelData< T >::copyTo(), BlockBaseRegister< T >::copyToSrcRegister(), LevelDataOps< T >::create(), LevelData< T >::localCopyTo(), MergeSolver< T >::solve(), and write(). Reimplemented from BoxLayoutData< T >. Referenced by LevelData< T >::copyTo(). Referenced by aliasLevelData(), PetscSolver< T >::computeResidual(), BlockBaseRegister< T >::copyToSrcRegister(), LevelDataOps< T >::create(), VCAMRPoissonOp2::diagonalScale(), NWOViscousTensorOp::diagonalScale(), ViscousTensorOp::diagonalScale(), VCAMRPoissonOp2::divideByIdentityCoef(), NWOViscousTensorOp::divideByIdentityCoef(), ViscousTensorOp::divideByIdentityCoef(), LevelDataOps< T >::dotProduct(), BCFunction::fillGhostCells(), LevelDataOps< T >::incr(), LevelData< T >::localCopyTo(), LevelDataOps< T >::mDotProduct(), and MergeSolver< T >::solve(). They can then hand this off to LayoutData::apply, which invokes this function for every T. The argument "box" is the Box (as known to the DisjointBoxLayout here) associated with that T and the argument "n_comps" is the number of components in this LevelData. Your function must not be inline. Like the other apply(), but here the argument is an instance of a class derived from LevelData::ApplyFunctor, and which implements ApplyFunctor's pure virtual void operator()(const Box& box, int n_comps, T& t) const. Going with an instance of such a class is more convenient if you want the thing you pass to apply() to have state. References LayoutData< T >::dataIterator(), BoxLayout::get(), BoxLayoutData< T >::m_comps, LevelData< T >::m_disjointBoxLayout, LayoutData< T >::m_vector, and DataIterator::size(). References CH_SPACEDIM, LevelData< T >::copyTo(), LevelData< T >::define(), DisjointBoxLayout::degenerate(), SliceSpec::direction, LevelData< T >::m_disjointBoxLayout, LevelData< T >::m_ghost, and BoxLayoutData< T >::nComp(). 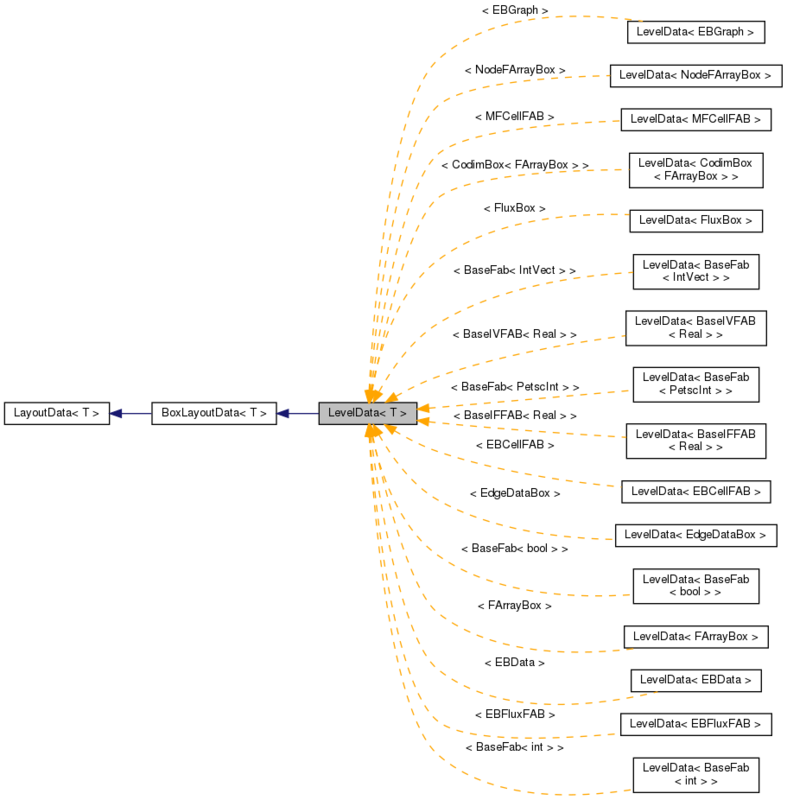 References LayoutIterator::begin(), BaseFab< T >::box(), CH_SPACEDIM, BaseFab< T >::copy(), LayoutData< T >::dataIterator(), LevelData< T >::define(), DisjointBoxLayout::degenerate(), SliceSpec::direction, LevelData< T >::m_disjointBoxLayout, LevelData< T >::m_ghost, BoxLayoutData< T >::nComp(), LayoutIterator::ok(), and LayoutData< T >::operator(). LevelData is-a BoxLayoutData. It is built from a DisjointBoxLayout instead though, thus making the data in a DisjointBoxLayout uniquely defined for all spatial indices defined by the underlying DisjointBoxLayout. It carries within it an inherent concept of ghost cells (which the user can choose to be empty). Since LevelData is-a BoxLayoutData, all the methods required of the template class T for BoxLayoutData are also required for LevelData. LevelData does not have any extra requirements. a_alias aliased LevelData<T> object. original data in a_alias is destroyed and new aliasing role assumed. a_original pointer to LevelData<T> that will be aliased. a_interval range of components of each T in a_original that will be created in the a_alias argument. Referenced by LevelData< T >::apply(), LevelData< T >::copyTo(), LevelData< T >::define(), LevelData< T >::degenerate(), LevelData< T >::degenerateLocalOnly(), LevelData< BaseFab< int > >::disjointBoxLayout(), LevelData< T >::exchange(), LevelData< BaseFab< int > >::getBoxes(), and LevelData< T >::LevelData(). Referenced by LevelData< T >::copyTo(), LevelData< T >::define(), LevelData< T >::degenerate(), LevelData< T >::degenerateLocalOnly(), LevelData< T >::exchange(), LevelData< BaseFab< int > >::ghostVect(), and LevelData< T >::LevelData(). Referenced by LevelData< T >::define(), LevelData< T >::exchange(), and LevelData< T >::LevelData().